Dr. Kimberley Sebastian received her Doctorate of Veterinary Medicine from the University of Liverpool, Liverpool BVSc in 2014. She also has a degree in Veterinary Pathology from the Royal Veterinary College, London BSc (2012). She is a member of the MRCVS, BVA, BSAVA, AVMA, MVMA and IVECCS. and was a nominee for the 'Petplan Vet of the Year' in 2017. Before joining AEC in 2017, Dr. Sebastian worked for one year in general practice and two years in general practice and emergency in the U.K. There she saw dogs, cats, a mix of exotics and many small hobby farm species - sheep, pigs, horses, donkeys, cows and lots of chickens! She enjoyed the challenge of seeing multiple species on an emergency basis, and never knowing what would walk through the door next. On some occasions Dr. Sebastian had to venture out in the Land Rover Defender to rescue trapped or injured animals around the English countryside! She also worked closely with two boarded specialist zoo vets for the Blackpool Zoo and often saw birds, reptiles, lemurs and monkeys. In the U.K. they also have lots of wild hedgehogs that she would see almost daily with various ailments and injuries. Wild hedgehogs are becoming endangered there due largely to increasingly busy roads, but there are a lot of programs to help increase their numbers. Dr. Sebastian is especially keen on continuing education and the changing face of medicine. "I was one of the lucky ones - I always knew I wanted to be a veterinarian. From a young age I would forever be on my grandparents farm with the pigs, cows and chickens. As soon as I was old enough, I volunteered at boarding kennels, farms and local veterinary practices. I truly love animals and the joy they bring to our lives. I believe they are part of our family and nothing brings me greater joy than reuniting a previously very sick pet with their owner. I believe that every pet and owner should be treated as an individual - What will work for one family, won't for another!" "I love everything about the veterinary profession; it is like having an extended family wherever in the world you go! 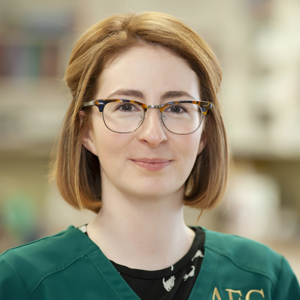 I particularly enjoy internal medicine, imaging, clinical pathology and working closely with pets and their owners to formulate plans that work for them." Dr. Sebastian is continuing further training in clinical pathology at MSU to become a boarded specialist by 2021. Dr. Sebastian moved to the USA with her American husband in 2017. She has two adopted Miniature Dachshunds and a pet cat who was originally found in a trash can - they all made the journey to Michigan!